Many age-related problems common to the eyes are caused by compromised circulation. 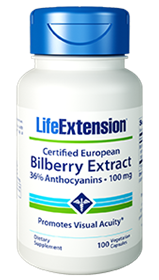 Bilberry extracts have antioxidative properties that not only are neuroprotective, but they also help suppress photooxidative processes and have been shown to improve microcapillary circulation. The anthocyanins content of bilberry may be especially beneficial for nighttime visual acuity. The eyes have a high concentration of tiny capillaries that can be affected by inflammation, blood pressure, and other vascular disorders. Because bilberry is effective at helping reduce inflammation, and it has the ability to strengthen the capillaries, thin the blood, and stimulate the release of vasodilators, bilberry has a very positive effect on eyesight. Bilberries contain a potent type of flavonoid antioxidant called anthocyanosides, and this antioxidant has been shown to support the cardiovascular system as well as eye health. Rice flour, vegetable cellulose, (capsule), l-leucine.